Born out of a fashion student's passion, VA by Vanshika Ahuja focuses on giving comfort as much a priority as style. The brand offers pretty Kohlapuris, clutches, hair bands, and juttis but the latter is their USP. Everything they've got is made by hand with meticulous precision. The materials used (including dabka, nakshi, zari, and more) are high on quality. For anything that's printed, the prints are selected very carefully. 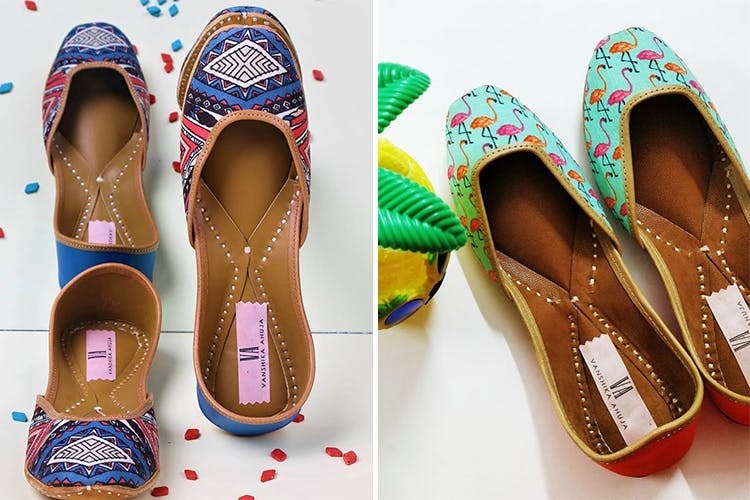 The mojris and juttis are worth checking out as they’re extremely versatile. They're the kind that you could wear to a local market and still pull off well in a wedding function. For me, the kohlapuris are priced a bit on the higher side.